Mary Ann for Victoria 3 and Aiko 3 is our latest package release (04-28-06). This character set has excellent texture definition in addition to its striking features and beautiful shapes for both mesh models. Mary Ann comes with a gorgeous set of 8 (eight) make up mats that suits both V3 and Aiko, as well as an unbelievable realistic set of 5 different color eyes. V3 default head and body textures, default eye color, default head and body morphs shown. Image has no post work except composition. Hair and jewelry are not included. Default head and body textures, default eye color default head and body morphs shown. Aiko 3 default head and body textures, default eye color and default head and body morphs. Image has no post work except composition. Hair is not not included. Mary Ann has an option of body texture with bikini lines. These mats will fit both V3 and Aiko 3. Different parts of Mary Ann's anatomy shown. suitable for any type of render or situation. There is a total of 9 (nine) sets.
? Minimum 16MB free hard disk space. 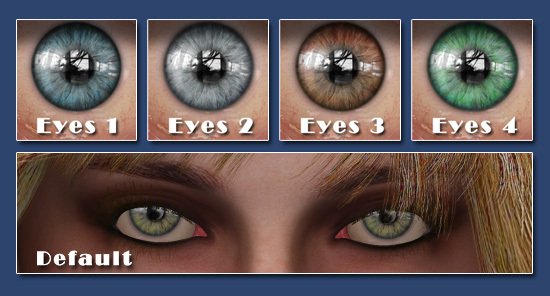 5 (five) sets (including default below) of eye color mats in beautiful realistic shades. Images shown have no post work. Not all options shown. Hair is not included.